Keiji Kawahara graduated from Department of Industrial Design, Kyushu Institute of Design (then Kyushu University) in Japan in 1976 with a Bachelor of Design, and finished Advanced Course in Industrial Design, KID. He also graduated from the School of Industrial Design, Royal College of Art, London in 1980 with a Master of Design, MDes. 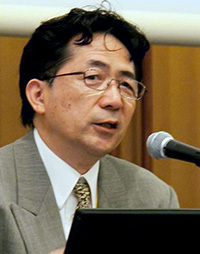 He held various posts including a member of a variety of public deliberative assemblies, such as a Judge of Good Design (G-Mark) Products Selection System, Ministry of International Trade and Industry, and a Coordinator of the Product and Development Committee, Tokyo Creative Committee. He had a serial column “Yasashii-Ippin” (User-Friendly Products) in Asahi Shimbun newspaper, and contributed articles for Nikkei newspaper, Gakken Co., Ltd., and a variety of trade magazines about food and nursing care etc. He gave lectures for local governments, academic societies, and public service organizations, and also gave lectures on Universal Design in UK, Germany, Spain, Norway, Korea, and Hong Kong. He received various prizes such as first prize in the Industrial Design competition for Zinc Die-casting for Braille Label Marker, UK, Governor of Osaka Prefecture Prize in the 2nd International Design Competition for Natural Fiber Reinforced Plastic Biogas Plant, Japan Design Foundation, and a Good Design Award for a Platform Safety System, and his Barrier-free Kitchen was selected into the Universal Design Exemplars. He has been specializing in designing living equipment for handicapped people since 1970s and been involved in the planning and development of a wide range of products such as industrial equipment, information tools, housing equipment, and medical and welfare devices etc. Especially in the field of universal design and sustainable design, he is an expert of product development related with social issues. He organized the International Conference for Universal Design in Japan 2002 and served as its promoter / member of Executive Committee / Secretary General, then founded the International Association for Universal Design (IAUD) in November 2003, of which he became Executive Director.